Etinski, M.; Corbalan, J.; Labarta, J.; Valero, M.
Never-ending striving for performance has resulted in a tremendous increase in power consumption of HPC centers. Power budgeting has become very important from several reasons such as reliability, operating costs and limited power draw due to the existing infrastructure. In this paper we propose a power budget guided job scheduling policy that maximize overall job performance for a given power budget. We have shown that using DVFS under a power constraint performance can be significantly improved as it allows more jobs to run simultaneously leading to shorter wait times. Aggressiveness of frequency scaling applied to a job depends on instantaneous power consumption and on the job's predicted performance. Our policy has been evaluated for four workload traces from systems in production use with up to 4 008 processors. The results show that our policy achieves up to two times better performance compared to power budgeting without DVFS. Moreover it leads to 23% lower CPU energy consumption on average. Furthermore, we have investigated how much job performance and energy efficiency can be improved under our policy and same power budget by an increase in the number of DVFS enabled processors. 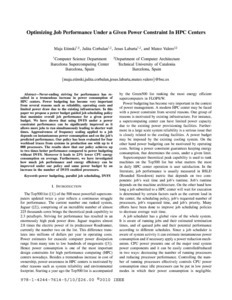 Etinski, M., Corbalán, J., Labarta, J., Valero, M. Optimizing job performance under a given power constraint in HPC centers. A: International Green Computing Conference. "2010 International Conference on Green Computing: August 15-18, 2010, Chicago, IL". Chicago, IL: 2010, p. 257-267.